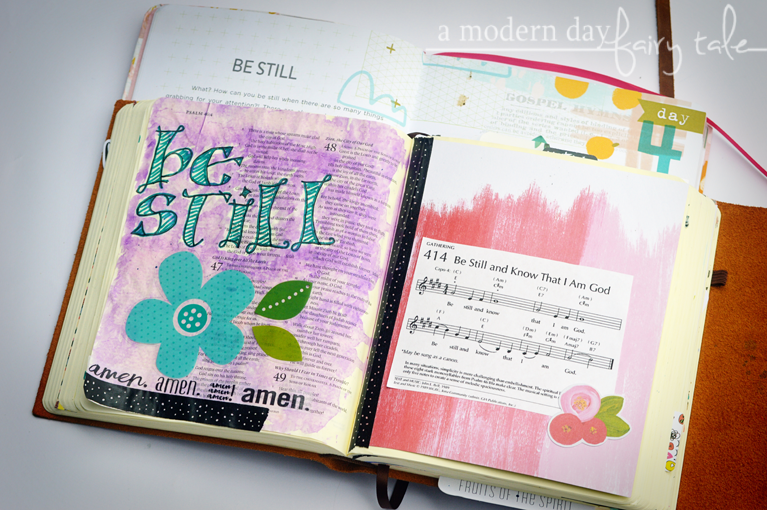 I am currently journaling through a great new journal from Illustrated Faith creator, Shanna Noel. Each day offers a new promise and room to journal though I am personally doing the journaling in my Bible, as I would love to revisit again in years to come if needed. As I work through these days, I am excited to share my experience with all of you! I am using these 100 days to get out of my creative rut and try new techniques and styles that I might not have before so through these days you might notice that. People often tell me I'm strong, and I must admit...I don't often feel it. More often that not, I feel like I'm failing at just about everything. Maybe that's the perfectionist in me. Through the chronic pain, the mental health issues, etc... many days I just feel like breaking down. Some days I do. (Okay, many days.) It is only through the grace of God that I can get back up and keep pushing forward. 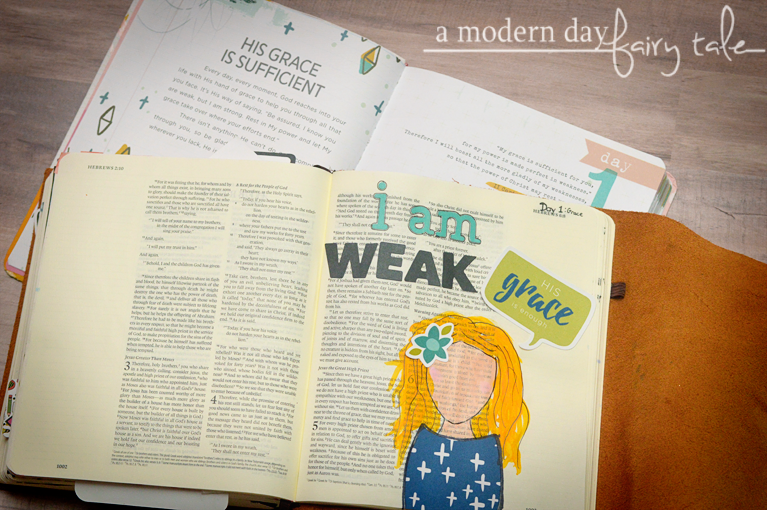 In my own weaknesses, He shines through. He gets me through it, one day at a time. For this page, I decided to step out of my comfort zone. I'm not much of an artist so I often stick to very simple pages with bright backgrounds and stickers or die cuts rather than drawing. 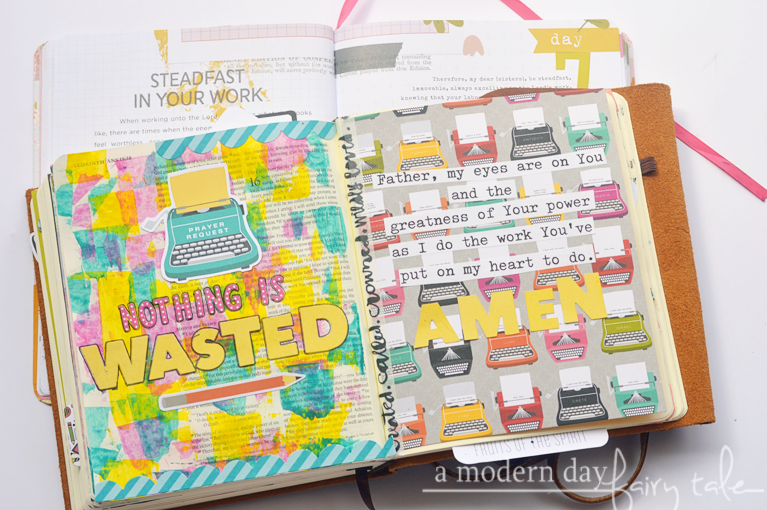 But I felt that this journaling challenge should be about stepping out of that comfort zone. While it's certainly not perfect, I am very happy with the outcome. Even more so, I love this message- Though I am weak, He is strong! Day 2: Don't Be Afraid. This is a message that I have to remind myself each and every day. The Bible talks a lot about not being afraid, but I think it's something that many of us struggle with. I love this reminder that God is with us, we have no reason to fear. Does it stop the fear from creeping in? Not always, but it helps to keep it in check most days! 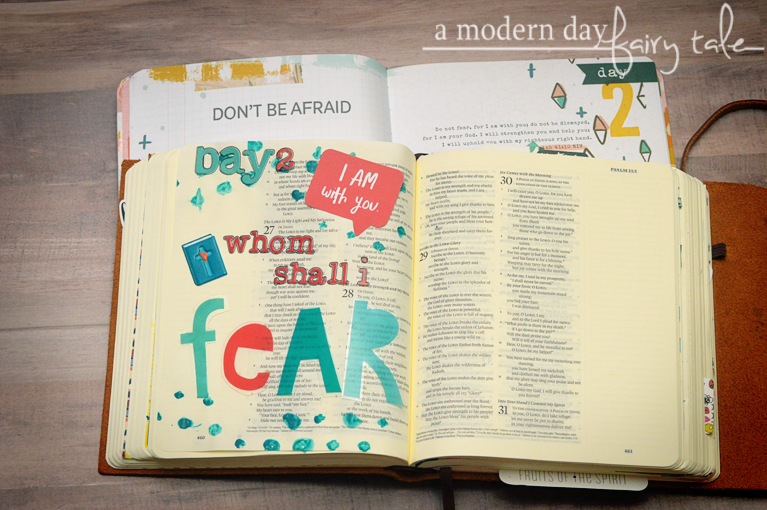 For this page, I'm a big fan of the Chris Tomlin song, 'Whom Shall I Fear (God of Angel Armies)' based on Psalm 27:1 so I incorporated that into my day two journaling. If you have not heard this song, I highly recommend giving it a listen. I kept the page pretty simple but had some fun with clear cut letters, another new one for me! I did have some issues with my stencil so my background wasn't as crisp as I'd have liked, but... that's where I'm having to let go of my fear of imperfection and just go with it! I often find myself feeling very overwhelmed. Honestly, I truly often feel like that weight of the world is on my shoulders and I have to figure it all out on my own. More than often, I find myself feel like I'm failing at most of it. This is a reminder that I need daily... I am not alone and God is more than enough to handle everything I am going through. For this page, I kept it pretty simple. 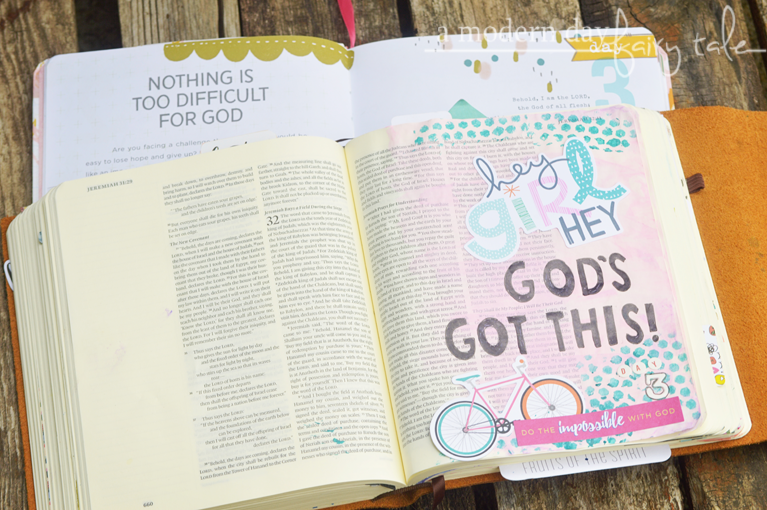 I loved this 'Hey Girl Hey' die cut from one of the recent Illustrated Faith collections, and wanted it to draw attention to those next word's... God's Got This. With Him, we truly can do and overcome the impossible. Stillness is hard to find these days. More often than not, I would in fact say that my life and my home is... well, complete and total chaos. Be still!? I'm not sure I even know what that means sometimes. Still in the midst of all that crazy--- or maybe because of it--- I do need to find those moments of peace, however fleeting to remember that God is still here. This is one of those pages where I tried something new with the lettering and background, and wasn't 100% happy with the results. Not my best work, but that's just part of the challenge, right? I did love the way the tip in on the opposite page turned out, and left myself plenty of room to come back and journal more thoughts on the subject. 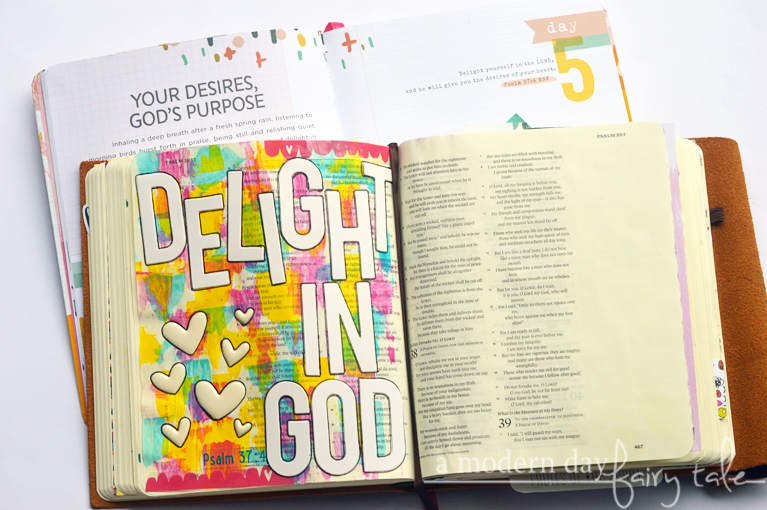 Delight yourself in the Lord and he will give you the desires of your heart. Now that doesn't mean He is going to give you absolutely everything you want... but perhaps He will work on our hearts and our desires will be more closely aligned with His purpose for us. For this page, I really wanted it to reflect that idea of DELIGHT with bright colors and bold images. I must admit when I started this page I had a different idea in mind--- cotton candy and ice cream (part of the Delight in His Day Collection from Illustrated Faith), but as I worked I found that I really just wanted those old beautiful colors to speak for themselves. This is one of my favorite pages so far. I must admit--- I'm a worry-er. This is something I struggle with every single day. I think as moms and women by nature we tend to worry to some degree--- add in anxiety issues... oh boy! I worry about everything! The verses in this particular devotion are all go tos for me when I start to feel it creeping in. I need those reminders daily, and multiple times a day... but thankfully I have many great verses to turn to and to pray on. For this page, I just couldn't resist bringing in the Disney. This is not the first Disney-inspired journaling page I have created (I've also done pages inspired by Brave, Inside Out and Frozen), but is most certainly my favorite so far! The Lion King is my absolute favorite movie of all time, so naturally when I think of not worrying, Hakuna Matata came right to mind. Sometimes it can be easy to feel like the work you do doesn't matter. Whether it's being a mom, a blogger or a typical 9 to 5 job... we don't often get the thanks we deserve. Or perhaps we just don't see how God can use us in the positions we're in. That can be discouraging. But if we use whatever we do--- from doing the laundry to running a company--- to bring the glory to God, that work is not wasted! This is something I strive to do in my writing, but as I worked through these verses I realized something I should try to be more intentional about doing in my work around the home as well. For this page, I really focused on that role as a writer/blogger. I feel like this is a passion that God has put on my heart long before I was even able to put the words to paper, and my prayer is that he will use that for His goodness. The page on the right is again another tip in which actually features the prayer from the journal for a better reminder as I flip through my Bible. After finishing week one, I am absolutely loving working through this journal.It has been a great motivation to get my Bible out and create more... but has also been great reminders daily of these amazing promises God has given us. If you'd like to join me on the journey, check your local Lifeway stores or order online. 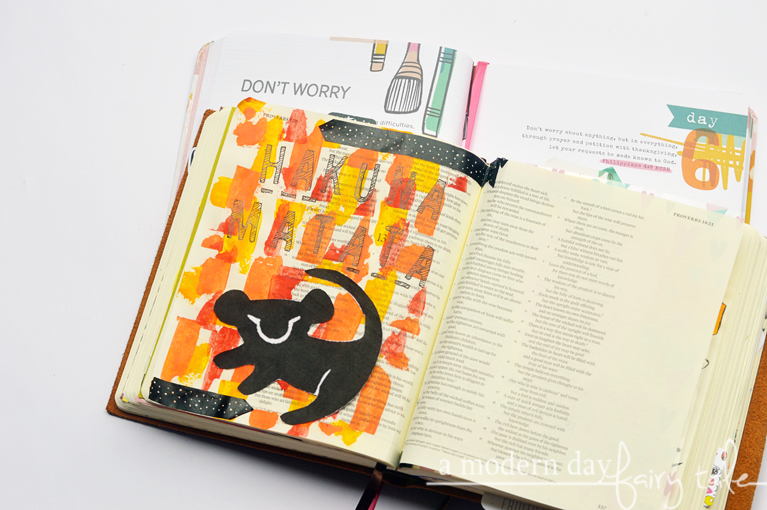 This is a great way to get started in Bible journaling (with no need for an actual journaling Bible since you can do so right in the journal), or if you're like me and just need some extra inspiration, it's been amazing for that too. Stay tuned for more as I continue to work through this journal myself. These are biblical tips and are there for our asking. God does not make mistakes and He keeps His promises! My granddaughter journals. It has helped her in a couple instances find out what triggers certain emotions.